It begins leaving by the main entrance of the campsite towards the right until arriving at the highway that unites A Lanzada with Pedras Negras in which we will take to the left. We followed way by the sidewalk bordering the beach of Raeiros until arriving at the end of A Lanzada. We lowered until the barefoot beach and we continued the stroll, taking advantage of that the waters of this one are medicinal by their high concentration of iodine and minerals. It is a perfectly signalized route and of little difficulty, that leaves from the classroom of Nature of the Siradella mount (42º 28’ 13’’ N – 8º 53’ 01’’ W) and runs by their surroundings. It crosses several viewpoints of a great beauty, with panoramic views of laughs it of Arousa, islands Cies, Ons and Sálvora. We go out by the access of the campsite to the highway S.Vicente-O Grove, turning to the left and descending that section from highway until passing the pharmacy; to about 50 ms of her we take a deviation to the right and continued walking until arriving at the beach of Mexilloeira (42º 28’ 28’’ N- 8º 54’ 24’’ W) . 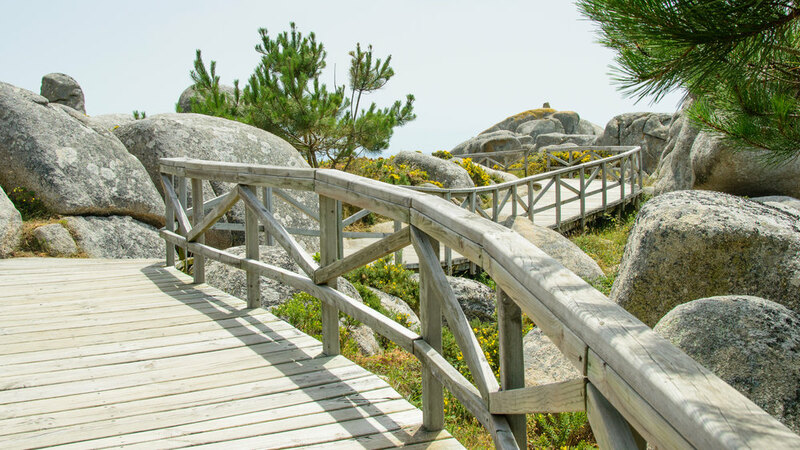 Once there, the footpath to the right takes us to the lagoon of Bodeira, where we will be able to observe some birds if we approached in silence. Returning by the beach we can make a route of the distance that we want, being able even to give to the return to the peninsula of S.Vicente crossing several precious coves. We can observe the views of the A Lanzada beach, islands Ons and Sálvora.